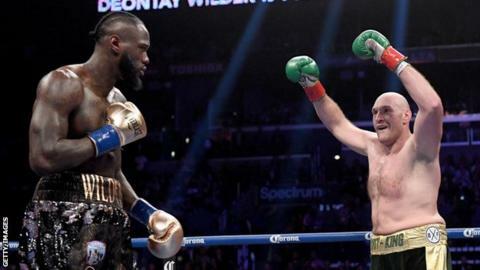 Tyson Fury will "take on another fight" before a rematch with WBC heavyweight champion Deontay Wilder, says the governing body's president. Last week, WBC president Mauricio Sulaiman said he was "confident" the fight would take place. But on Tuesday, Sulaiman said the rematch would be "at a later date". "While WBC champion Wilder confirmed his willingness to fight the rematch, Fury will take on another fight with expectations to do the rematch at a later date," he wrote on Twitter. Last week, Britain's Fury, 29, signed a lucrative deal with US broadcaster ESPN and will receive a reported fee of £80m for five fights. The other recognised world heavyweight championship belts - WBA, IBF and WBO - are held by Britain's Anthony Joshua.